The Hockey Hall of Fame has put a good number of high quality books over the past few years. They always fill the glossy pages with brilliant photography and interesting sidebars filled with information. And they always fill get a top writer to fill the main content of the book. So when the Hockey Hall of Fame decided to release a book of trivia they went after hockey's trivia king - Don Weekes. Weekes has put out more hockey trivia books than I can count. The man has this down to a science. He knows how to create a book for every level of hockey fan, whether they are new to the game and learning about it's fantastic history, or an expert who is tough to stump. 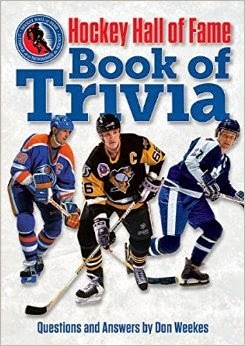 Hockey Hall of Fame Book of Trivia is no exception. It is a perfect Christmas gift for any hockey fan. From the publisher: Unique facts and little-known data for the fervent fan. Hockey Hall of Fame Trivia features the most distinguished and influential men and women who have ever played the game, policed the ice or called the shots from the bench and the boardroom. In his latest book hockey trivia guru Don Weekes, who has written more than 20 hockey-trivia books, has created 160 unique questions and eight trivia games that chronicle the members of the Hockey Hall of Fame. Superstars Evgeni Malkin and Ilya Kovalchuk wear sweater numbers honoring which Hall of Fame member? How many of the five Canadian skaters who were on the ice when Darryl Sittler scored the climactic 1976 Canada Cup-winner later became Hall members? Which modern-day player entered the Hall of Fame having scored the highest percentage of his team's total goals in one season? Which NHL 500-goal-scorer waited the longest for Hall recognition after his retirement? Fully illustrated with 300 images, Hockey Hall of Fame Trivia will enlighten novice fans, challenge die-hards and provide fun for anyone of any age interested in hockey and the Hockey Hall of Fame. The Hockey Hall of Fame and Museum in Toronto honors and preserves the history of ice hockey and those who have made outstanding contributions and achievements in the development of the game.